SivaSivaa awakens us to the “I Am” experience, the higher purpose of this precious life time and the focus to achieve & unfold this magnificent reality. 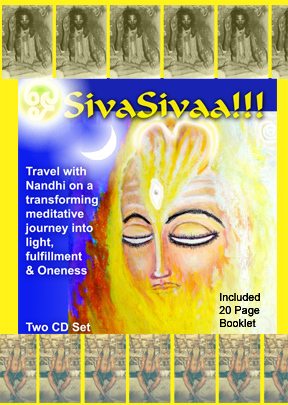 SivaSivaa is a two CD set. The CD set includes a detailed booklet leading you through each step in an easy to understand way. CD One is the inner journey of initiation. CD Two is a sing/chant along utilizing all that you learnt/absorbed in CD One. – Be initiated into the potent ancient mantras of the enlightened yogis and be graced by their Presence. – Awaken the Kundalini fire and transform each facet of our life through the blossoming of each energy field, the chakras. Guide the Kundalini energies to assist in creating a life we seek. – Learn the advanced but simple meditative techniques that enlighten and align our mind to Source. – .Join our sacred Siddhar circle! We hold satsangs by telephone (most Thursdays), New Moon satsangs and yoga satsangs that are exclusive for those who have taken the in-person journey with Nandhi or the SivaSivaa. The moment you have completed your SivaSivaa, email us to be put on our special list. Payments for any of the satsangs is always as love offerings. – Sacred Ash (vibuthi) & vermillion that are collective blessings of the various Gurus, sacred shrines & temples & the Ariven Temple. Saffron cloth from Thiruvannamalai, an ancient spiritual center of India. The use of a turban enhances meditation. Make your chant and meditation potent! 108 is a number that completes to be whole. When we recite any mantra with full intent to be in the Now moment, we invoke the specific dimension of Source present in the mantra. Join our sacred Siddhar circle! 1. Siddhi Ganapathy mantra- Awaken the root chakra, the muladhara. The awakened root chakra brings success and fulfillment in all the basic needs- love, career, wellbeing and sensuality. When the root chakra is awake, our journey to evolve from human to angel has begun. All obstacles of karma dissolves away and hence, Ganapathy is also called, The Lord of the Journey”. 2. Siddhar Guru mantra- ARAKARA- “Arakara” is a mantra that connects us back to the ancient Siddhar lineage that goes beyond thousands of years. This is the mantra of manifestation. “Aaa” is the invoking of Source; “Ra” is the fire within, the awareness of the mind; “Ka” is the human reality, mother Earth. When we say the whole of this mantra, we manifest ourselves to be Source. What else is worth asking Source for, other than to be Source!? Be initiated into the Arakara mantra! 3. Becoming love in the three dimensions- Heart Mantra: “Ra” is the awareness and “Ma” is the awareness. “Rama” mantra was Mahatma Gandhi’s most personal mantra. The great epic Ramayana owes its creation to the transformation of a robber to a sage (Sage Valmiki) thanks to this mantra. To transcend above towards enlightenment, we need to be love as in the unconditional oneness. Resonate in the sacred trinity of meditative realms- the places where Sages “park their mind” while meditating! 4. Goddess of abundance and sustaining Grace! When with the divine energy of the heart, we are also within the human reality that is nourished in abundant grace, wellbeing and love. Goddess Laxmi provides for spiritual and material abundance. This mantra enables harmony in human relationships and our heart’s opening that graces us with the presence of the Goddess. Blossom! For thousands of years, Sages recited the Maha Moksha mantra as one of the revered mantras for Lord Siva. This mantra provides a protective sheath against any danger, wards off death, heals the mind and body and leads us towards enlightenment. This mantra carries the energies of countless realized beings having chanted this mantra for all the years to invoke the presence of Lord Siva, the Destroyer of Death and Ignorance. 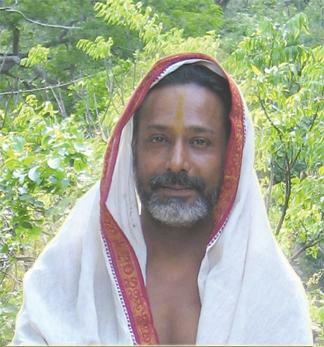 The Maha Moksha mantra is Nandhi’s most treasured mantra as due to his experience with the mantra. The story: Shortly after having received the mantra from his guru Bhairava Sekar Swamy, Nandhi and four others were trapped in a cave in Karnataka, South India, where killer bees descended on them. Thousands of them! Two of his friends managed to escape but were still stung atleast over 10 times. Nandhi, who was in shock, went into reciting this mantra and felt a cool blue energy cover him. He felt himself covered with bees and felt the bees go into his nostril, his ears, under his shirt- but not one stung him. His other friend was rolling in agony with bees repeatedly sting him. They were later rescued by the villagers. Not one bee had stung Nandhi. Nandhi owes the protective energy of Lord Siva to the Maha Moksha mantra. 6. Goddess Durga Mantra– Goddess Durga’s sacred presence is exceedingly protective. She protects us as a mother would, her new born baby. This mantra destroys the demons of of karma, ignorance and evil. As a protective Mother, any danger before us is vanquished. This a the Durga mantra initiation. 7. Siva Sivaa- “Si” is the Awake Soul and “Va” is the Goddess. To chant Siva- Sivaa is to invoke ourselves to be Lord Siva through a mantra that feels so much like our inner joy. Lord Siva is called Satchidananda, which means- Form of Blissful Awareness. Siva Sivaa enables us to be the Spirit. The union in ONE. The One that brings divine perfection into every facet of our lives. 8. Manifestation and the knowing! With the mind having woken up to the primal joys of Being, intent is made more powerful wit the focus into the third eye. Later, in silent meditation, this technique applied causes us to go deeper into the advanced techniques such as kechari mudra. By gently applying this technique, our normal thoughts acquire focus to manifest. Beyond wanting to create is wanting to “Know”. We are woken up to our truest purpose with our third eye opening. If we know our inner most purpose, we live an inspired life that is blessed by wellbeing, love and an ascended daily journey. 9. Descent into the human realms that evolves and the healing energies. After experiencing and dissolving the nectar of joy through the experience of being Spirit, the Sages advice us to come back into the sustaining energy fields of the mind, Lord Vishnu. The inner journey is like climbing up a tree and coming down safely. This final mantra brings us back to the human reality where our mind is awake to Source and the mind is more aware and illumined to enact thoughts and decisions. Lord Vishnu mantra initiation helps come back from the Spirit into human reality with all the abundance. Shanthi: Peace – We invoke peace as we come back to human form to represent humanity, all the living and our individual energy space. We allow ourselves to be the divine instrument through acknowledging peace for all of humanity, all the living and the shrine we are. 1) I’d like to start by introducing you in the piece. Can you give me a brief summary of how you got on your current spiritual path and became acquainted with the teachings of the Siddhar Sages? As a little boy living in India, aged 14, I met my first “Guru” Lewis Parker, who was from UK. He later assumed a fatherly role in my life. Our common ground was philosophy. His deep experiences with Mother Kundalini was so revealing to me of the knowledge I was familiar with. Later, he sponsored me to UK where I completed my higher studies and then returned to India. This was more than two decades ago. Shortly after I returned back to India, he committed suicide. His death broke all the theories and philosophies I thought I knew. After a struggle trying to understand the deeper wisdom from the pains of death, I felt a deeper sense of agony begin. It was then that I began to sense my own death coming for me. The pains of death was engulfing with deep depression with the question of “Why me?” at first and then, a primal fear. The moment I surrendered and let go, I felt an ancient bond reconnect. It was then that I heard this voice in me say, “I will come and take you today!”. The voice sounded so clear, as though from heaven. The whole day I waited. Special Combo Price for our two music albums, Cave of the Siddhars + Invoke the Masters + SivaSivaa, the inner journey of teachings and initiation. The continued sacred breath! A notch more intense!